Thursday May 18th saw Croydon Bicycle Theatre debut at the Croydon Cycle Fest, held alongside the Tour Series. 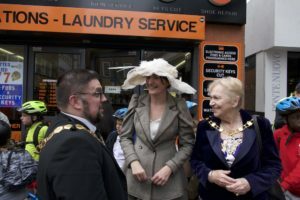 Croydon Bicycle Theatre was formed following the Croydon Cycling Campaign’s ‘CRO Ghost Tour’ in November and aims to create original theatrical events that will get people onto their bikes in the borough. 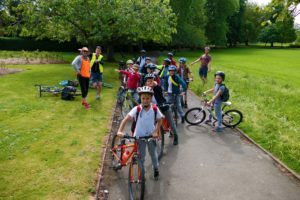 Thursday’s event saw the group work with two Norwood Primary schools on a heritage ride, introducing the children to Tessie Reynolds (the 1893 record breaking London to Brighton cyclist) and her controversial rationals. Tessie, and LCC volunteers, led the group through Croydon’s parks into the town centre ready for the schools cycling events at the festival, encouraging the children to share what cycling means to them along the way as well as what it meant to Tessie. Many of the children joined the Mayor’s ribbon cutting ceremony, launching the schools racing event and getting a taste of what it felt like to compete on the professional circuit.